Proceedings of a Conference held at the Department of History, Archaeology and Cultural Resources Management of the University of Peloponnese in Kalamata in collaboration with the Department of History and Archaeology of the University of Crete on March 18-19, 2011. 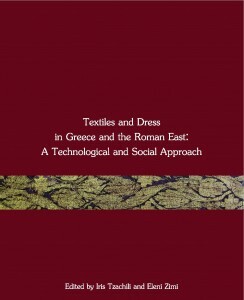 The conference “Modern Approaches to the Study of Ancient Textiles: Technical and Social Aspects of Roman Dress” was held in Kalamata on 18-19 March 2011, jointly organized by the Department of History, Archaeology and Cultural Resources Management of the University of Peloponnese, and the Department of History and Archaeology of the University of Crete. Both the conference and the present volume, containing most of the presentations, were implemented in the framework of the European “Culture” Programme “Clothing and Identities: New Perspectives on Textiles in the Roman Empire” (abbreviated as DressID). The programme participants include European research institutes (such as the Centre for Textile Research, Copenhagen), museums (Reiss- Engelhorn-Museen, Mannheim, Naturhistorisches Museum, Wien) and universities (Valencia, Crete, Sheffield). The programme brought together scholars working in different fields, institutions and countries under a common aim: the study of clothing and textiles as a means of investigating human historical identity.